And this would be my grand-puppy, Louie. He is a litter mate of my little bundle of joy - still named Chewie! Having these two little guys around has given me the opportunity to laugh, really laugh from the belly! Imps they truly are. Love to chew papers, chase each other, and periodically fight like true siblings! He is suppose to go home this coming Monday and I don't know who will miss him more.....Chewie or me. Secretly I'm hoping my son finds him too much to handle when he starts work. After all he is a puppy and needs lots of loving, attention, etc. while son will need lots of sleep. Being the loving Mom (tehehe), I have suggested I could keep him during the week and son could take him on weekends and days off....at least until he is out of this adorable puppy stage. Works for me!! Don't you agree it is the perfect solution?? Still snowing and blowing here in Michigan........yikes, spring cannot be that far away....can it? Who Could Possibly Resist this Face? Not me!!! Meet the newest addition to our family!! Isn't he adorable? I'm not sure timing is in my favor, with the Michigan snows and potty training.......but you gotta do what you gotta do!! 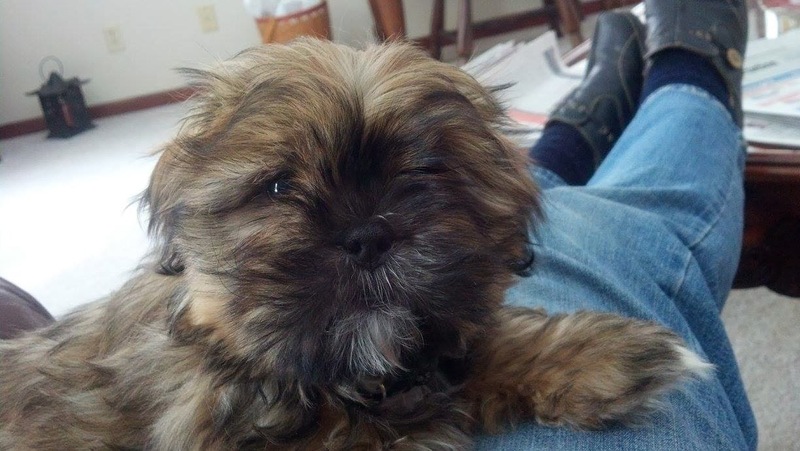 Still trying to decide on a name - and for now Chewy is sticking. Not sure what we will end up with.....I've NEVER had any trouble naming my animals! It is snowing and blowing here......again. Just much easier to tolerate when cuddling with this furry little bundle of joy!! Hope everyone is cozy and warm!! !